Wow! What a game last night!! 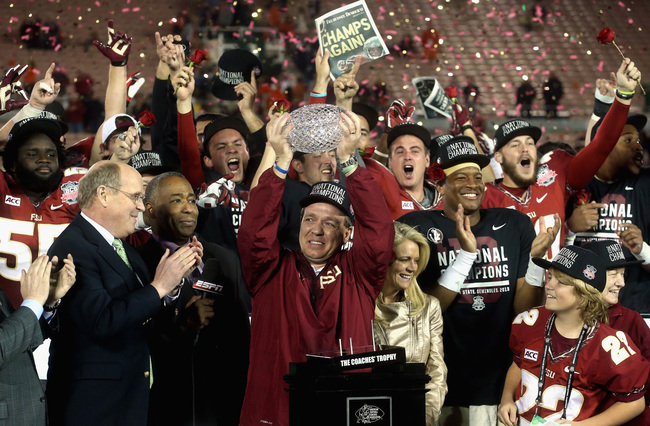 I’m so proud of my Seminoles for how they fought until the end to become the 2013 National Champions. The teams played so hard and both Auburn and FSU should be very proud of the seasons they had. After the way this year went for the ‘Noles it was a bit of shock to see them struggle through the first half. I must admit that I still don’t understand everything that’s going on in the game, having grown up in Italy and being raised on soccer, but fortunately I have a 12 year old expert on all things football and all things FSU. Kiko kept reminding me that FSU has the #1 defense, the #1 offense, the #1 quarterback, the #1 coach, the #1 mascot, the #1 uniforms… Well, I guess you get the picture. In his eyes they have the #1 everything and it was unfathomable that they could be losing. Poor Stefi, my 7 year old, had to go to bed with tears in her eyes when we were down 21 points. She’s been through a lot this week, what with the snow they promised us not coming, so the last thing she needed was for her beloved Seminoles to lose. Luckily, she got a midnight wake up call from the Seminole warchant that accompanies our family touchdown dance whenever FSU scores. She couldn’t help but notice that it played a little longer and louder last night and she slept the remainder of the night safe in the knowledge that the BCS National Championship Trophy was headed back to Tallahassee where it belongs. I am especially happy for Coach Fisher and his family. They are such great people and have been through so much the past few years. They truly deserve this moment. For those of you who are not familiar with their story, Jimbo and Candi Fisher have two young sons, Trey and Ethan. A couple of years ago Ethan was diagnosed with Fanconi Anemia, a rare blood disease. Jimbo and Candi started the Kidz1stFund to raise awareness and funds to fight this disease. Kidz1stfund.com is a great resource for anyone who is looking for more information on Fanconi Anemia. I just love watching those boys on the sidelines of every game and I’m so happy that they were able to share this moment together. Congratulations, Seminoles and Let’s Go Panthers!! !